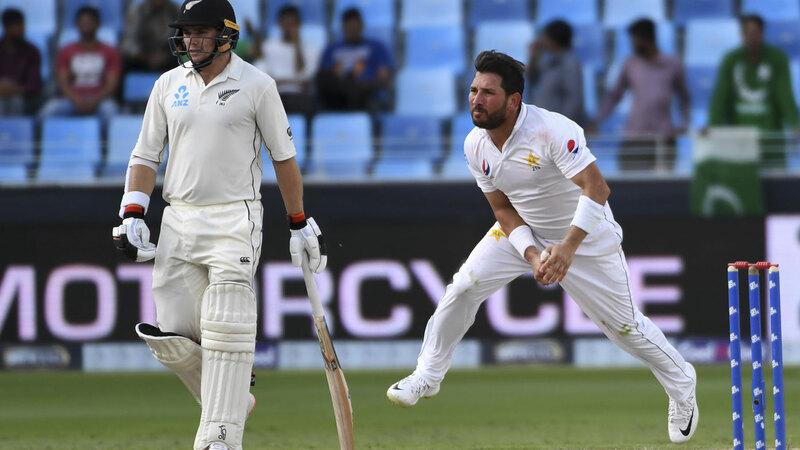 Leg-spinner Yasir Shah put Pakistan in control of the second Test on Monday with a career-best 8-41 as New Zealand rallied to 2-131 in its second innings after being forced to follow-on in Dubai. Having reached 0-50, the tourists were dismissed for only 90 runs in the first innings to give Pakistan a massive lead of 328 on the third day. The Black Caps lost their 10 wickets within 40 runs in little over an hour of play, thanks to a mind-boggling collapse of 9-29 in seven overs. New Zealand were going along at 61-1 in 27 overs but lost 9-29 runs against Shah and company to get bowled out in only 35.3 overs after the lunch break. Unusual rain showers in Dubai delayed the start of day's play for an hour before New Zealand resumed on 24-0. Fast bowlers Mohammad Abbas and Hasan tied down both openers with their impressive swing and seam bowling before Shah ripped through the top order. Asad Shafiq spilled a low catch at second slip off Hasan's delivery that could have dismissed Raval (31) on his overnight score of 17. But Pakistan didn't have to wait long to get the breakthrough when the left-handed Raval played on while attempting an ambitious reverse sweep shot to Shah. Shah's triple strike then ignited the New Zealand collapse in the penultimate over before lunch. Taylor's struggles continued in the series when, one ball later, he was bowled after playing around Shah's sharp leg-spin. Shah's first innings figures were the second best by a Pakistan spinner in the country's test history. Leg-spinner Abdul Qadir holds Pakistan's record of most wickets in an innings when he claimed 9-56 against England in Lahore in 1987.